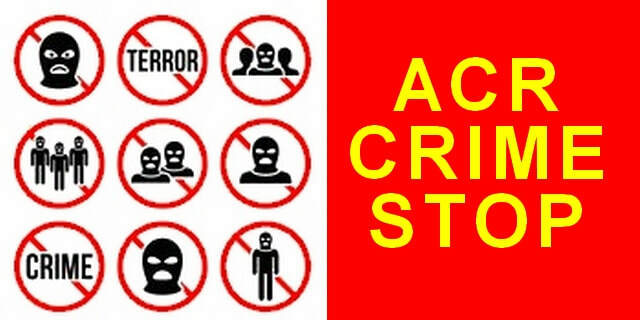 ACR Crime Stop - ACR National Crime Initiative SA (PTY)Ltd.
ACR and its Vetted Partners have strategically set up this Crime Stop Page. All intel received is handed over to trusted and vetted members to attend to the relevant matters accordingly, dealing only with relevant authorities and members who have shown constant honesty, and dedication towards combating crime. ACR and its partners are aware in many circumstances, criminals "get away" with their wrongful doings, whether its due to intimidation or corruption. This crime stop platform serves to bridge the gap, and bypassing certain channels, reporting incidents to the relevant trusted members attention to action accordingly. Whilst this platform is open to reporting intel, members must understand that results are not instant once reported. Once we have received the intel, we will pass on accordingly. once Intel is received by relevant trusted Members and Law Enforcement, there is in many circumstances further processes that need to be followed such as intel followup and further investigations, as well as CASE Building. When reporting please provide as much details as possible and attach any pics / videos containing evidence.